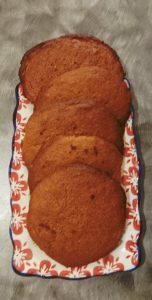 My daughter created a delicious GF Vegan Pumpkin Cookie Recipe this weekend. The cookies are soft and chewy and didn’t dry-out even though they were left out over night on the counter. I thought I would share this delicious recipe for those of you whom might suffer with numerous food allergies like we do in our home. Combine the flour, baking soda, cinnamon, baking powder and salt in a bowl. Then in a larger bowl beat or mix the brown sugar and vegan butter in a bowl until well blended. Next add in the pumpkin, psyllium husk/water and vanilla extract until smooth. Finally add the flour mix in slowly to the mixture and beat until combined well. Then spoon on the mixture to the baking sheets. Preheat oven to 350F. Grease the baking sheet or line with parchment paper. Bake for 15 to 18 minutes. Then cool on a baking sheet if possible.